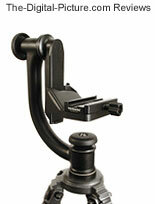 Note: The Wimberley Gimbal Tripod Head has been replaced by the Wimberley WH-200 Gimbal Tripod Head II. When is the Canon EF 400mm f/2.8 L IS II Lens a featherweight? When it is mounted on a Wimberley Gimbal Tripod Head! If you are using a very large/heavy lens (300mm f/2.8 or larger), I highly recommend the Wimberley Head and a solid tripod. When properly mounted on the Wimberley Gimbal Tripod Head, a heavy lens and camera body become nearly weightless to the photographer. Only two fingers are needed to move a setup such as the Canon EF 400mm f/2.8 L IS Lens mounted on a pro body into position. Gimbal tripod heads such as the Wimberley Head place the weight of the lens/camera setup below their pivot point. Thus, gravity pulls the setup into a level position. On the other hand, gravity attempts to cause the same camera/lens to flop over when mounted on a non-gimbal tripod head. Yes, many of the best non-gimbal heads (such as the Arca-Swiss Z1 are rated for far more weight than my example lens above (400 f/2.8). And they really can support the weight. But, you must fight against gravity when making adjustments. And if you don't get everything tight, the lens can flop over into the tripod - with the potential for costly damage. And hold on tight if you are going to leave the mount loose for panning. The Wimberley Sidekick is a less-expensive gimbal head solution that can handle lenses up to including the Canon EF 500mm f/4 L IS Lens. The Sidekick is smaller and is convenient to pack along with your normal ball head, but the Wimberley Gimbal Tripod Head is a more elegant solution that takes little or no additional time to setup. The Wimberley Head has four adjustment knobs. 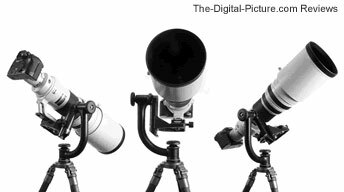 Two of these are used to setup the lens/body combo (they remain tight during use) and two are used for adjustments during use. The base/bottom knob controls the panoramic rotation friction. The top/side knob controls the elevation adjustment friction. Another knob allows adjustment of the platform elevation (moves the mounting clamp up/down in relation to the elevation pivot point). The last friction knob is on the C30 quick release clamp (a model is available without this clamp). To setup the Wimberley Gimbal Tripod Head ... After unscrewing the normal ball head (if you don't have the luxury of a dedicated tripod), the Wimberley Head screws onto the tripod legs in its place. The base/bottom friction control knob must be firmly tightened for this step. With the tripod approximately leveled, the platform elevation knob very tight and the elevation friction knob slightly loose, the lens/body is gently placed into the clamp and adjusted forward/backward until the setup is balanced. The clamp is then tightened. Do not let go of the lens until the clamp is tight. During use, the two larger knobs controlling panoramic and elevation friction are loosened/tightened as desired. The tripod collar friction knob is used to control camera orientation (the third dimension). Many times all three can remain loose during use (after setup). This allows a subject to be followed - or framed quickly. And the lens stays basically in place when you let go. Transporting of such a setup often involves tightening all friction knobs and putting the entire rig over your shoulder. A camera and lens combination without a tripod ring can be attached to the Wimberley Gimbal Tripod Head, but Wimberley Perpendicular Plate is needed to allow the mount to work properly. This is not an elegant solution, but can eliminate the need to carry an extra tripod head. Real use functionality of the Wimberley Head is excellent. Two fingers can easily position a huge lens on your subject - and follow it. I highly recommend the Wimberley Gimbal Tripod Head when using a lens the size of a 300mm f/2.8 or larger. Note: A lens plate is required on the lens' tripod collar to utilize this version of the Wimberley Head.